Do you love loud music? Here are the speakers that many die for. The Logitech speaker system z623 is best in terms if you need good quality sound and for connecting it to your desktops for enjoying any kind of media. If you want high-powered stereo sound then these speakers are what you are searching for, which is available at a reasonable price. These speakers are THX-certified and have 200 watts (RMS) which provides the ability to take up the volumes to a different level and give you a studio-sound quality. Following is the Logitech speaker system z623 review that will enlighten you about its different features. Setting its standards apart from the regular mainstream speakers, these Logitech speakers provide an output of 200W RMS that is way greater than usual. 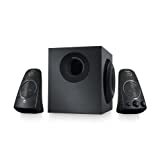 It efficiently provides clear sound surround and deep bass for your visuals. It is even decked with two magnetically screened satellites, which are rated 35 Watts RMS (power output) each. With attached cables at the bases of these satellites and a 3 inch mid-bass driver, both satellites are secured with the help of a non-removable grill. The volume control, power switch, bass-level controller and 3.5 mm audio jacks are supported by the right satellite. It also has a powerful sub-woofer that is supplied with an 8 inch driver that is front facing along with a bass port. The rear end of the speaker’s woofer has been supplied with a 3.5 mm input (stereo) and other RCA inputs. • The speakers have been so designed that they give a perfect look to be placed atop your desks beside your PCs. They have a sturdy and attractive built that efficaciously allures customers. • The clarity of sound produced by the speakers is simply nonpareil. • The 3.5 mm input as well as the on-speaker controls are quite nifty and manually comprehensible. • The levels of the sub-woofer can be easily adjusted to deliver a powerful and moving output. • These speakers are solely designed for the purpose of enjoying audio over your desktops with an enhanced experience. • Since the sound provided by these speakers is only directional, it lacks behind in this area. • The cables that have been hardwired make the setup complicated following the complicacy for its repair. • It does not come with a remote control that is a negligible point because the controls that have been provided on the speakers are extremely operational. • Customers sometimes complain about the huge size of the sub-woofer and bass being too heavy. However, if the bass is turned off, the speaker delivers an exceptional performance. The Logitech speakers that have a dimension of 7.8 x 5.6 x 5.4 inches have been so angled upwards to be perfectly positioned alongside your desktops for clear listening is wider and shorter than regular desktop speakers. Moreover the number of features that it offers in such reasonable price is highly commendable. The sound levels provided by these speakers can be raised to unimaginable extent to deliver ultimate performance. Now that you know, the different good and bad sides of these speakers, you should not leave out the opportunity to purchase these speakers which are worth every penny of your investment.